Be the first to share your favorite memory, photo or story of Jim . This memorial page is dedicated for family, friends and future generations to celebrate the life of their loved one. 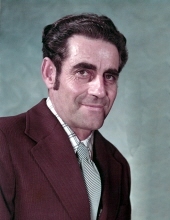 Jimmie Max Scott, son of the late Earnest Afton and Marie (Raney) Scott, was born July 23, 1927, in Searcy, Arkansas, and departed this life April 8, 2019, at Cox Health in Springfield, Missouri. He was 91 years, 8 months, and 16 days of age. Jim went to school at Shady Grove school, south of Mountain Grove. He married Betty Ruth Gartin. Five children were born to this union. Later he married Ruth Crisp and then married Betty Jean Fosset. In their spare time, he and Jean enjoyed hunting for antiques together. Jim was a dairy farmer his entire life. From 1947 to 1962, he worked at a large farm in Friend, Kansas. He later moved to his family farm south of Mountain Grove and farmed there for the rest of his life. He greatly enjoyed spending time fishing and hunting. Besides his parents, Jim was preceded in death by his wife, Betty Ruth Scott, two sons, Kenny Scott and Ronnie Scott, one grandson, Michael James, one brother, Robert Scott, and two sisters, Dollie Scott and Alice Jean. He is survived by two sons, Jerry Scott (Nancy Mason) and Don Scott (Tammy) all of Cabool, Missouri, one daughter, Marie McGaughey (Kevin) of Kansas City, Missouri, three brothers, Bill Scott (Anita), Levan Scott, and Ernie Moore (Carol), three sisters, Nellie Louise, Doris Albauer, and Willa Scott, grandchildren, Jimmie Scott, Bethany Cashman, Scotty Scott, Johnny Scott, Chris Scott, Kerry Scott, Justin Shields, and Jamie Manly, and other relatives and friends. To send flowers or a remembrance gift to the family of Jim Max Scott, please visit our Tribute Store. "Email Address" would like to share the life celebration of Jim Max Scott. Click on the "link" to go to share a favorite memory or leave a condolence message for the family.